Your gaming computer should be like you: reliable and cool under pressure. In order to achieve this, your PC’s case must be equipped with proper cooling and fans. Performance isn’t the only thing that matters, though. After all, you don’t want to just be cool, you want to look cool, too. And in 2019, nothing says “cool” quite like RGB lighting… at least when it comes to RGB lighting. Which is why today we’ve set out to find the best RGB fans on the market. We’ve reviewed our top five picks and also included a guide down below to help you know what to look for when shopping for computer fans. If you’re not interested in the extra premium price associated with RGB fans, then you might want to check out our 10 Best Case Fans. When it comes to RGB, it’s mostly about the looks. Contrary to what some believe, RGB lighting does not make your PC run faster and does not improve benchmarks or frame rates. RGB will, however, make your computer look awesome and will possibly even make all your friends jealous of your awe-inspiring battle station. 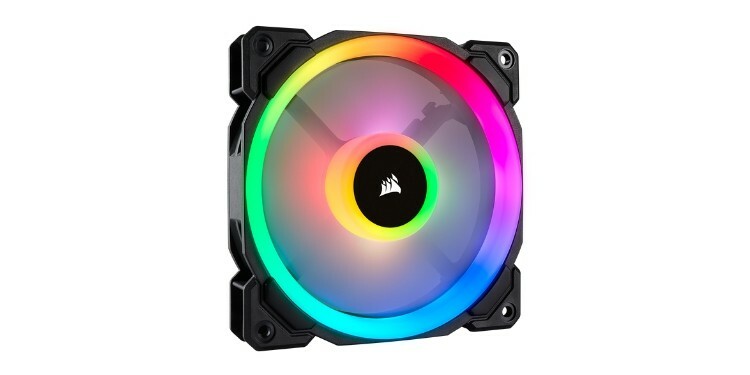 If this is what you’re after, then the best RGB case fans for aesthetics are the Corsair LL120. These fans sport a light ring inside the fan hub that shines light outward into the fan blades, while a second light loop on the outside of the frame of the fan adds an additional halo of stationary lights around the fan. Each of these loops has eight individually addressable RGB lights that can be controlled through Corsair’s iCUE software for tons of customization. Corsair’s software allows for practically unlimited animations and color combinations using the 16 RGB LEDs on each fan. There are a number of packages available including single, dual, or triple packs of the fans. Also, you can opt to either have the lighting node included or not, but you will likely need one to run all of the fans and RGB. While these fans don’t offer the most total airflow, they are incredibly quiet and offer excellent static pressure, the highest on our list in fact. This makes them the best RGB radiator fans on the market as they can easily blast air through dense radiators. Now that we’ve covered a fan for those just chasing after the most luminous ways to cool their PC, now let’s take a look at some fans that actually put performance at the top of their list. The NZXT Aer fans live up to their name with impressive airflow for their size. These fans are available as both 120mm and 140mm versions, with the larger variants boasting greater airflow and static pressure at the same RPM and noise level. Speaking of noise level, these fans are pretty loud, especially for the relatively low RPMs that they run at. If you’re looking for a quiet fan, these are not it, but if you want fans that will quickly replenish the air in your case and keep your hardware cool then these are a good option. The 120mm RGB fan pushes 52 ft3/min of air while the 140mm RGB fan moves an impressive 91 ft3/min. This is enough airflow to keep even very high-end hardware cool and is the highest on our list. Also, while not quite as much pressure at the Corsair LL series fans we looked at, these NZXT fans still offer enough static pressure to be used on radiators. As for the lights, these fans have a single light loop around the perimeter of the frame of the fan and lack any illumination within the fan blades themselves. 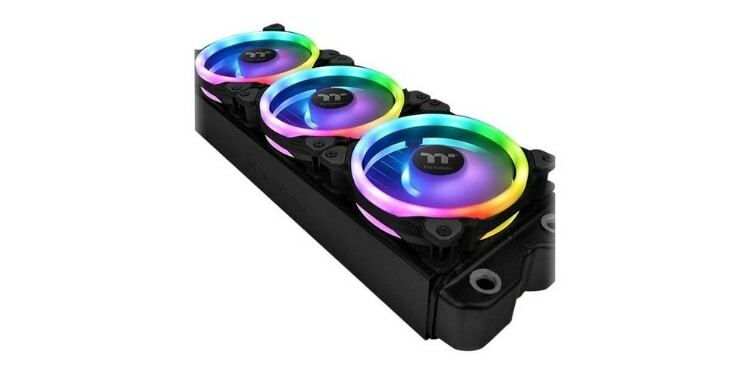 These fans come either individually or as a triple pack, but unfortunately do not come with any kind of fan controller or hub, making it very important to ensure you have enough of the right kinds of connectors on your motherboard, or you’ll need to pick up a hub separately. Despite the fact that we opened our reviews in this article by praising the 16 RGB lights in the Corsair LL series fans there is actually one other contender on the market that can more than give Corsair a run for their money in the RGB department, and that is Thermaltake. 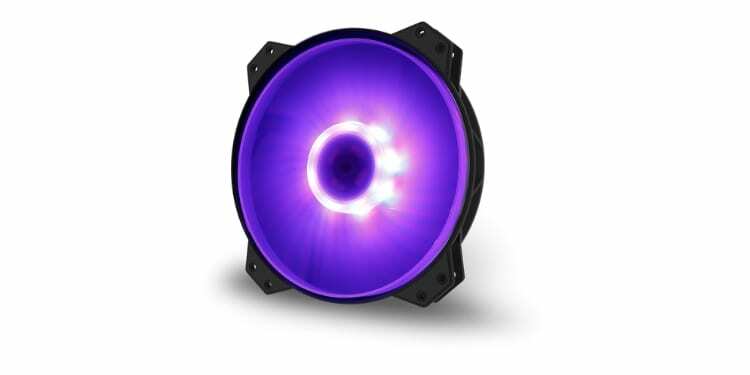 Thermaltake has crammed an impressive 30 individually addressable RGB lights into their Riing fans. There is a light loop around the edge of the fan on both sides, which each contain 12 lights, and the final six are illuminating the fan blades themselves. This makes these truly the best RGB PC fans and the undisputed kings of radiance. Even better than that though, is the fact that these fans even come with an included hub that allows you to plug in up to five of the fans and easily control them through software. Thermaltake’s software also boasts some unique and impressive features such as Alexa integration that allows you to change the color and speed of your fans using voice commands. So you’re probably now wondering why these aren’t at the absolute top of our list by now, and the answer is performance. Yeah, RGB is all about being cool and all, but when it comes down to it we feel more comfortable recommending the Corsair fans that will save you money, and perform better with greater airflow and static pressure while still looking great, over Thermaltake’s inferior performance for the sake of gratuitous vibrancy. When it comes to case fans, one size sits at the top of the food chain like the mighty apex predator it is: 200mm. These elusive fans are pretty rare to spot, and counterintuitively are often found in smaller cases. They offer some interesting benefits though, so let’s take a look at why a 200mm RGB fans might be right for you. Larger fans can, as you probably already know, push more air through your case per minute. In fact, this 200mm fan flaunts the second highest airflow rate of any of the fans on our list, beaten only by the 140mm NZXT Aer fan. 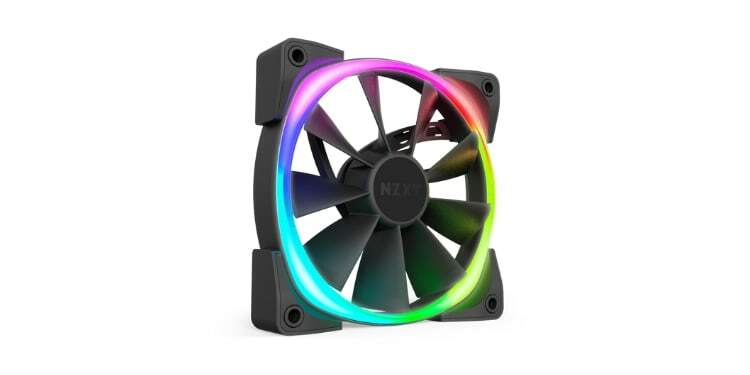 However, to achieve its narrow victory over this 200mm fan from Cooler Master the NZXT offering has to spin about twice as fast and produces much more noise. Larger fans not only move tons of air but also do it running at a lower RPM; therefore generating less noise. So if you’re looking for a fan that can offer excellent cooling alongside nearly silent performance, then large fans might be worth checking out. These fans are also compatible with almost any RGB controller and software including ASUS Aurasync and Gigabyte RGB Fusion. That being said make sure your case can actually fit one of these beasts before you buy one. RGB fans can be very expensive, and the price tag of some of the options on our list was probably even a bit startling to some as the bundles can easily reach over $100. 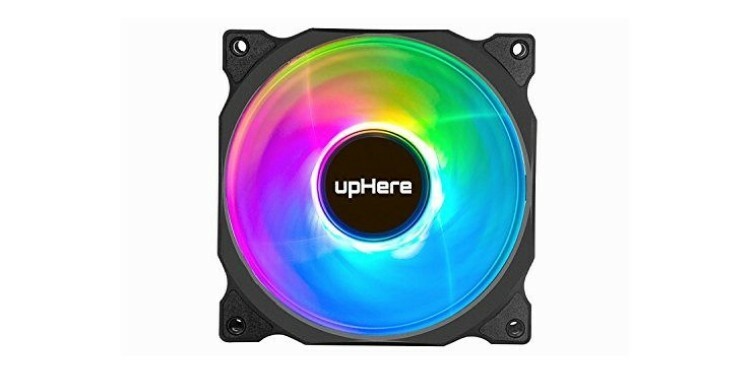 Well, a company called upHere has decided to put an end to the outrageous prices surrounds RGB fans and offers a five pack of fans at an incredible price. For less than the cost of a single LL-series fan from Corsair, you can get your hands on one of these budget-friendly powerhouses and light up your rig like never before. For one thing, five fans is a ton, especially for this price. Five fans are more than even some high-end gaming machines will ever have. What’s even more impressive though is that fact that these fans have pretty similar performance specs to the much more expensive Corsair LL fans. In fact, these fans from upHere have more airflow and nearly as much static pressure while being even quieter than the LL series fans. This is where the savings come in. In order to make them so affordable, some corners had to be cut when making these fans. These fans are controlled using a wireless remote rather than software, meaning you will have less control over the color and pattern of the lights. Now that we’ve looked at our top five picks for RGB fans let’s take a more in-depth look at what some of the stats we discussed mean and what to look for when shopping for fans. The first and probably most obvious thing that people think of when they think of fans is airflow. Airflow can be measured a number of ways but for our purposes, we kept everything to cubic feet per minute. This is an empirical measurement of the volume of air that the fan can move when running at its maximum RPM. The more airflow a fan has the more air it will be able to push through your case or across your heatsink to keep your hardware cool. If you’re looking for the best airflow possible, then the NZXT Aer is a great option. This fan comes in either a 120mm or 140mm size with the 140mm option offering the highest airflow on our list. The other major specification that is important to look at when shopping for fans– and which is not mentioned quite as often– is static pressure. Static pressure is a measurement of how hard a fan blows the air and is measured in mm H2O. This is important if you’re planning to use the fan to cool a radiator or a heatsink since these put a direct barrier in the path of the airflow. This means that the fan has to push the air through or around the radiator or heatsink, which reduces the total airflow. Fans with higher static pressure can more easily force air through radiators and heatsinks. If you plan to use your RGB fans for this, then we suggest using the Corsair LL 120 fans as these offer the best static pressure of any of the fans in our roundup. As recently as a few years ago the reality of noisy case fans was inescapable; screaming fans at startup were the norm. Nowadays, however, many of the fans on the market not only offer excellent cooling performance but are also super quiet. Almost all of the fans on our list are practically silent with most of them having decibel levels of around 25 to 30 which is a little quieter than the noise of the average library. If you’re looking for the quietest fans possible though, then the upHere wireless RGB fans are a great option. However, they might not have the best build quality or longevity due to their budget nature. Another great option for those looking for a silent PC, but who are looking for a bit more quality out of their purchase, are the Corsair LL series fans. Corsair makes very quiet fans that offer good performance and look amazing, so you really can’t go wrong with these.